We build computer models that use numerical methods to characterize groundwater flow. 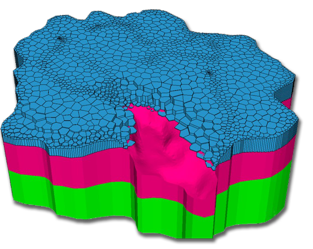 MODFLOW models provide insight to determining sustainable aquifer yield and how to manage groundwater. We conduct environmental reporting and analysis for studies involving groundwater consumption, pumping systems, contamination, and technical analysis for groundwater related engineering or management problems. We use Saturated-Unsaturated Transport (SUTRA) to characterize contaminant transport problems in the vadose zone and optimize pump-and-treat plans to efficiently remediate the groundwater. Wallace Groundwater provides professional groundwater modeling services to the state of California. We are located on the Central Coast, with centralized access to the Central Valley, Salinas Valley, San Joaquin Valley, Los Angeles, Sacramento, and the Bay Area. When most people hear the word ‘groundwater’ they think about lakes deep underground, or streams flowing in channels like caves. But in reality, groundwater refers to all of the water reserves that lie in the pore space between rocks, sands, silts, and clays. All of the technicalities aside, the most important thing to know about groundwater is that it provides us with the majority of the water we use for agricultural, domestic, municipal, and industrial uses. As such, it is extremely important to characterize and understand the groundwater resources that we have available to us in California. With the recent passage of the Sustainable Groundwater Management Act (SGMA) in 2014 by the Department of Water Resources (DWR), groundwater regulations must be in place for over one hundred groundwater basins in California by 2020 or 2022, depending on the prioritization given by the DWR. As a part of the SGMA regulations, groundwater conceptual models, aquifer budgets, and groundwater and surface water flow models (sometimes coupled) must be developed to develop groundwater sustainability plans and develop sustainability criteria. High priority basins, with undesirable results like subsidence, depletion of groundwater storage, chronic decreases in groundwater levels, saltwater intrusion, and depletion of surface water resources due to groundwater extraction, require detailed hydrogeologic assessment, characterization, and evaluation over time. At Wallace Groundwater, we specialize in everything related to groundwater. This California groundwater modeling company wants to help you determine the impact you are having on groundwater and establish processes that will help ensure we have sustainable groundwater. We offer a series of services that will help you in your quest to be a more environmentally responsible person or business. Our business covers everything from consulting to modeling so that we can offer you the best solutions available for your specific case. Our numerical services also cover environmental analysis in order to detect any management or engineering problems involving groundwater contamination, consumption and other situations. Wallace Groundwater is focused 100% on groundwater, and our services are completely specialized and provide the highest quality geohydrologic characterization studies that you will find in California. We are ready to provide groundwater solutions in Central Coast of California but provide services for the Central Valley, San Joaquin Valley, Salinas Valley, Sacramento, Los Angeles and the Bay Area. We are focused on environmental sustainability and aim to work towards a better future by helping out with the groundwater situation in our country. Wallace Groundwater is available Monday through Friday from 8:00 a.m. to 5:00 p.m. and you can easily contact us by mail or phone to learn more about the technical and field services they offer and how we can help you improve your systems or install new ones, depending on what you need. © 2019 Wallace Groundwater. All Rights Reserved.